This Fort Lauderdale fishing report is a positive one as Tropical Storm Colin has passed far to our west bringing plenty of rain to the west side of Florida and on into Georgia and above while we saw very little weather here on the SE side of Florida. I don’t think we fully lived up to ?the Sunshine State? moniker as we had plenty of clouds, but the bad weather was to our west, just west, but an inch is a good as a mile when it comes to these things. A near miss is still a miss. Kingfishing has been good and remains strong. 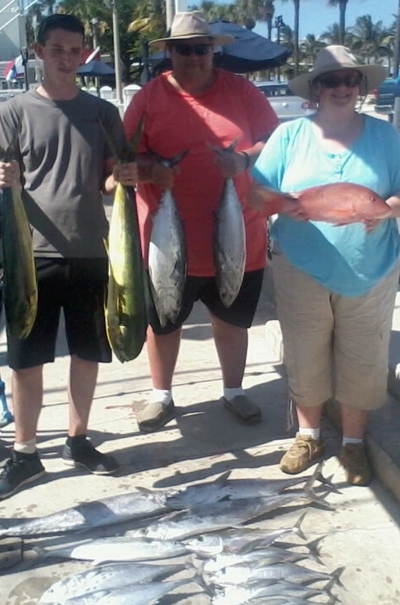 These fish are a staple for us and the bite has been best to the south of our inlet in water ranging from 90 to 120 feet in depth. Good numbers of Bonito bending the rods as well and once again we are more than happy to see them in the area as we need them for those strip baits we shape from their skin and our cupboard is essentially bare. Was essentially bare. We have actually had a few clients take some home lately. Well…. years ago we would never dream of eating an Amberjack and now we do, but I don’t think the Bonito has much of a chance of cracking the top ten anytime soon. So we skinned them out and they took the meat and we kept the skin for those precious strip baits. Everybody wins. Our bottom buddies the Golden Tiles have continued to be difficult out in the deep water. They have seemed almost automatic for months but the last three tries at them have been a bust. The good news is that the Blackfins are biting out there most days and it is a quick change from one to the other as they are very much in the same area. Out way offshore there are some Swords to be had. That’s if one can keep that Sword bait on the bottom in 1800 feet or so without a Bluefin or Big EyeTuna eating it. Heard of 5 this week. Happened a bit last summer as well. Give us a call, we have the tackle for this Sword/ Tuna developing storyline. Cape Breton Nova Scotia certainly isn’t in danger of losing the crown, but this is interesting stuff. Big Jack Crevalles moving along the shallow reefs and the beaches and these are the big ones. Great fun, lousy to eat. Did I say great fun? Tiger by the tail for sure and they will work you out. Maybe the Bonito recipe would work for them too. Sailfish no. Wahoo no. Mahi-Mahi some Amberjack yes. Mutton Snapper too. Tight lines, there is good action for limited species, and that action can be very good.